The Science of Arabic grammar (النَحْو ) is the study of how to join words to form correct and meaningful sentences. The way this is reflected is through the ending of words which is what makes Arabic such a rich and vast language. 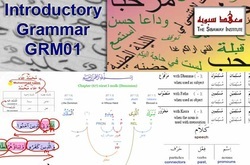 The focus of this course is grammatical theory through which one will appreciate the depth of the Arabic language through the works of classical grammarians for over a millennium. ​It is recommended to study this course prior to commencing MAD01: Madina Book 1 Explained and Expounded​. We do have an option to purchase this course and MAD01 for a discounted price.